With the holidays fast approaching, it’s great to have a simple low sodium side dish to take to parties. 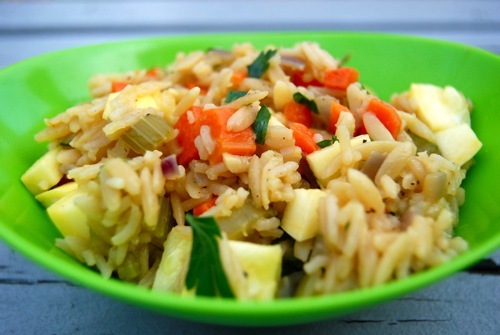 This pilaf is perfect potluck fare. It partners well with a variety of other flavors and cuisines, but is an equal standout on its own. One word of advice. Have everything prepped and ready before getting started. The recipe zips along and you don’t want to miss a beat – or a later compliment! Recipe adapted from Kitchen Basics Healthy Cooking with Stock. Heat oil and butter in a large saute pan over medium-high. 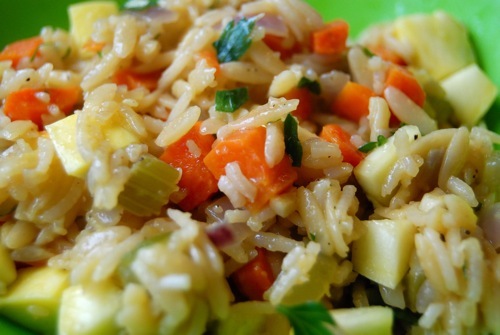 Once the butter is melted and foam subsides, add the orzo and cook, stirring constantly, until orzo is golden brown, about 1 minute. 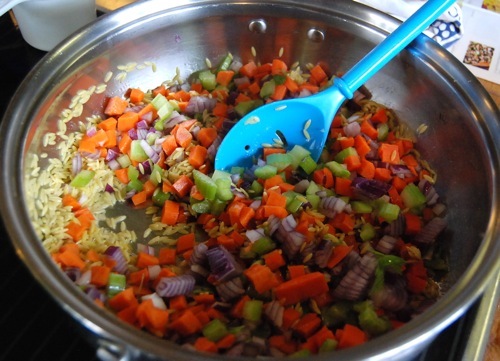 Add the onion, carrot, celery, garlic and freshly ground black pepper to taste. Lower heat to medium and cook, stirring, until onion is lightly browned, about 5 minutes. 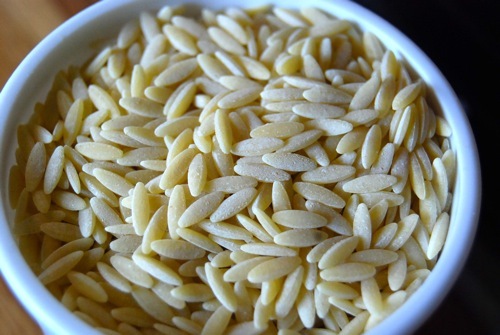 Add the rice and stir until coated with oil and butter. Add the stock and water and bring to a boil. Reduce heat to low and cover. 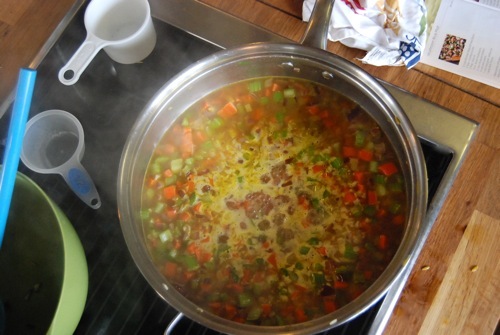 Cook until liquid is absorbed, about 15 minutes. Remove from heat and add the diced zucchini or squash. Stir in thoroughly, then cover and let stand 5 minutes. Stir in chopped parsley and serve immediately. This entry was posted in Kitchen Basics, Side Dishes. Bookmark the permalink. How much rice? Also, it says to serve immediately but how would this be if made the evening before it is to be served?